This is a very basic baby hat in several sizes. This is designed for in-the-round knitting. 11/3/2013 – made adjustments to sizing. 2/19/2014 – added stitch counts to the decreasing rows of the crown. 12/17/2015 – replaced a broken link for Magic Loop method. 1/26/2017 – added “in-the-round” to description. Just wondering if the size 6 needles required are British, Metric, or U.S.? well, so have now done that. Thanks for asking. I finally found time to knit your hat except I needed an all garter stitch to match a garter stitch jacket. As well, I used regular knitting needles (to knit flat). I began decreasing, but found that the k3 k2tog ssk would not work evenly working on the 72 stitches that were remaining after working the first decrease row starting with the 96 stitches (toddler size). What have I done wrong? The first decrease row should leave you with 80 stitches. Make sure you are including both k4’s so that there are k8 between each decrease set. I need help with two issues I cannot figure out. First issue I didn’t do the magic loop while using the circular needles so I will have to stitch up the side of hat. Will that affect the decrease method given? Second I managed to knit so many rows and then pearl so many so I continued on with that pattern, do I stick with the same decrease pattern given ( preemie) or would I knit on the knitted rows and Pearl with the pearl rows? Also for the just knit rows would they remain the same due to the fact I never magic looped? Thank you so much and hopefully I explained it well enough to understand, first time making a hat. Go ahead and stick to the pattern of knit rows and purl rows you’ve already established so that the crown will be consistent. If you need to purl one of the decrease rows to fit your established style you can replace the ssk and k2tog stitches with p2tog stitches. I am a new knitter. What is a round? Can I use regular needles for a hat or do I have to use round ones. What exactly is a ssk. Is there any video on how it is done? The pattern I want is the cable baby hat, but I need it larger than a newborn. I need for 12 months. How many more stitches do I need to add? I knit in the round on a lot of things. There is little need for my straight needles anymjore. I just use circular needles. My knitting is more of an Eastern European, so it is hard for me to follow patterns, but I know that ssk for me, means the stitches come together to make a left leaning stitch, from 2. Good luck! If you’re a new knitter, you’ve probably stuck to straight needles so far or to put it another way, been knitting flat. There are two other kinds of needles. Circular and double pointed. These allow you to knit in rounds, or circles. This means if you want to knit stocking stitch you only use knit stitch. If you want to knit this in the round, I’d get a circular needle to star, much easier to get the hang of. Does the circular needle need to be 40″? Isn’t 40″ too wide? I have not tried knitting in circulars but I thought the circumference of the circular needle should be the same as the head size of the hat. Please enlighten. Thanks! The 40″ circular needle is for using the magic loop method for knitting in the round. (http://weebleknits.net/mloop.html) You can also use a 12″ or thereabouts circular and just convert to double pointed when you get to the crown. To use straight needles, after the ribbing you will need to purl the back rows. You will need to seam the completed hat. Lovely patterns. Can you please email me – I am on the board of a non-profit organization and would like to discuss obtaining permission to use your patterns for various purposes. Hey, I was wondering if it made a huge difference if I used a size US 7 needle instead of 6? I know it may make the hat slightly bigger, but I have heard of others going a needle size up on different projects and they’ve turned out fine. Would I just have to cast on a few less stitches if I used one size bigger in the the needle? Thanks! You might want to do a small swatch and check your gage with the larger needle. If it is going to be bigger than the given gage, you could cast on for one hat size smaller but then follow the height directions for the size you are making. Thanks for sharing this. I was looking for patterns for small hats to dress some bears for charity. hi, thanks for the lovely pattern. a question: when i decrease, instead of transferring to dpns, can i transfer to a long circular needle and do the magic loop method? Absolutely. I make all the crowns of my hats using the magic loop. I actually make my baby hats entirely using the magic loop. Can I use these instructions for knitting in the round or do I have to do the magic loop? Love the hat! These instructions are written for knitting in the round, but you don’t have to use the magic loop. Use your favorite method. Thanks so much for making this pattern available! How many cast on stitches do I need to make for the toddler hat? Thank you for this fast, easy pattern. It’s turned out beautifully with a self striping yarn! I am not sure what magic loop is? Help! Am I missing a special instruction for the preemie size hat? On the second decrease row (k3, k2 tog ssk, k3) I end up with one stitch extra at the end of the round. The other hat sizes work out correctly. It should work out like the other sizes. For the preemie size you start with 60 stitches. The decrease round instructions are repeated 5 times. So the first repeat round will have 10 stitch reductions resulting in 50 stitches. The second decrease round will also be repeated 5 times. It takes 10 stitches and reduces them to 8, so a total of 50 to 40. Could you have possibly missed one of the reductions on the first reduction round? Are you saying rounds 1 through 9 for the crown are repeated 5 times or each decrease round is repeated 5 times in a row? Thanks! The cast on for the hat for preemie size is 60. The pattern is a repeat of 12 stitch, so for the preemie size, the instructions for each round are repeated across the round 5 times. Hi I too would like to make premie and newborn hats to donate. Is it ok if I use your pattern for that purpose. I worked the pattern and it is so pretty. Thanks! Exactly what I was looking for. A two month old who is recovering from cranial surgery thanks you!! What brand yarn did you use to make this hat? My example in the picture is made with Bernat Softee Baby Solids & Marls. I am knitting with size 10 circular needles, double worsted yarn. 1 has a head size of 18″ and the other 19 1/2″. I am knitting with 4 gauge/1 in, 2 colors at once. Do I still cast on 108 stitches. If the whole 4 stiches are within the inch, cast on 72. If the four stitches are a little more than an inch, cast on 60. Will it matter too much between the head sizes of one child being a girl and one a boy? Your tips have all been helpful. The hat will be stretchy so it will fit a range of sizes. The pattern is a multiple of 12, so with your gauge, will make a difference of about 3 inches between possible cast on amounts. Can this hat possibly be slightly slouched for my toddler? If so what do I have to do? I would think just making it a little taller should do it. This is a great basic baby hat pattern. I have had some requests from people to purchase my finished products of your pattern. Do I have your permission to sell this item made by me on Etsy or at craft fairs, if it comes along with your name and blog address for credit of your work? You have my permission. Thanks for asking. Great hat pattern. My children 10,12,& 16 and I are making them for Hurricane Sandy victims on Long Island. It’s my hometown. Thanks for the simple and quick pattern. Hi I have a question! For a 3mo boy would do the 72 or 80 CO? If I did 82 do you think size 5 needles should make it small enough?? Also may I make a few to donate to a charity? Thank you!! CO 84 and use size 5 needles should be perfect. Definitely make some for charity. I know they will be greatly appreciated. Cool pattern! Great instructions and super easy to knit! Thanks! Found this pattern via ravellry, wanted to practice ‘knitting in the round’. Wooop!! I made the hat! Lovely easy pattern, popped my circular cherry, and apart from needing some practice on the last few rows (struggled a bit, must look I to this magic loop); success!!! I even made a mini Pom Pom on a fork! For the top. Love it!!! I don’t have any babies to knit them for so will donate them. Hello — I really appreciate the pattern! Just one question: I’m on row 6 (or so) of the ribbing and my hat looks like a mobius strip. I’ve been knitting with circular (US 7) needles. Have I done something wrong/should I start over? Unfortunately it sounds like your cast on was twisted when you joined. There isn’t a cure for that but to start over. I just made your hat and it is really nice thanks. Except that I think there is a mistake in the decrease. For the even rows (2, 4, 6, etc.) It says knit but I think it should be purl otherwise it breaks the stockinette stitch pattern. I did as it said and it created garter stitch at the top of the hat (in the decrease). Am I right? This pattern is written to be made in the round so that all work is done on the right side, so all rows are knit. I used size 4 dpn, should I decrease the number I cast on? Since you are using smaller needles you would actually increase the number you cast on to make the desired size. The cast on stitches on this and the train track baby hat differ by 24 stitches for 12 months, why the difference? I get the yarns are different, but is the one used for the track hat thicker? Thicker yarn and bigger needles, so different gauge. What if I use 2mm pointed needles, how many stitches will I need to cast on? Does your yarn call for 2mm needles? What is the gauge of your yarn? Hello Mama, I have been knitting on and off since I was 5; (watching JFK funeral). The last two years I have been injured and am glad to be back with some light knitting. I have a anothre new gran son and I’m thrilled. I found your hat pattern, (lost my old) and it was wonderful. Many others are having babies and want me to make them some too. Do I have your permission to sell this hat? I will donate 1-4 ratio to our local children’s hospital. You can sell them. Thank you for asking. Yes the k4 is twice. The first rnd reduces 14 stitches, so 70 remaining. Great hat——-JUST TOO BAD I had to print 11 pages of comments to get 1 page of instructions. There is a little printer icon at the top of the pattern that makes a page with just the pattern, perfect for printing. Copy & paste into an email to yourself. No 11 pages !! How should I modify the crown pattern if I’m casting on 74 stitches? I’m using cacasde 220 and have 4 stitches per inch for a 18.5″ circumference..
Start the crown two rows early. K5, k2tog, K35, k2tog, k30. Do one more row of knit and then proceed with the crown as written. Thanks for this practical resource! It knits up great. You’ve taken the guesswork out of basic hats. Before I found your pattern I can’t tell you how many times I’ve begun baby/children’s hats and had to take them apart and redo because I was using the trial and error method! How many double point needles do I need for this little cute hat? Is it 3, plus one working needle? I am very new to all of this. This is actually just personal preference. Three and a working needle or four with a working needle are the usual setups. You might start with three and if that works for you, then great. If not, you always have the option of adding another needle. Thank you! Are there different lengths of 4 mm double pointed needles? What length would be best for this? I saw that 40 mm is the length I would use if I did circular…so should I get 40 mm dpn? Thank you again. I can see how many people you have personally responded to. I appreciate it. The 40 for the circular length is inches which would be about 100 cm. I use a really long circular needle and use the magic loop method instead of using double pointed needles. Most double pointed needles I use are about 8 inches or 20 cm long. Loving this hat pattern! Super easy! I’m using sz 6 dpn and dk yarn… and i feel like this hat is measuring up WAY too big for a newborn.. but.. ive also never been AROUND newborns.. >_> Am I crazy? hahahah Thanks for the great pattern! I see you have a pdf button at the top, but theres no way to save it. Is it possible to download this pattern to keep on my nook?? Thanks! If you hit the PDF button at the top it should give you a pop up with a clean printable version of the pattern. It also has a PDF button at the top. If you push that PDF button it will have a Download Your PDF button that should then give you the box to designate where you want to save the PDF. OH! dang! I didnt wait long enough for it to ‘generate’ the pdf! Awesome! Thank you for answering so quickly! What should I change to make this hat for my 5 year old? I made 2 of your King Charles Brocade newborn hats for our daughter (due in 8 weeks!) and they are lovely! The toddler size should actually work. It finishes at 18″ which is the perfect size to stretch to a 20″ head. I am a beginner so excuse my inexperience. Shouldn’t the crown be purl for rows 2, 4, 6, and 8? This hat is made in-the-round, so that the work isn’t turned. All work is done on the front side. Thanks for the lovely pattern! This is my first time knitting in the round and I’ve reached the end of the newborn pattern and still have 12 stitches. Is this the correct stopping point or should I continue to reduce so I have fewer loops to secure? It’s personal preference. You can do a round of k2tog to reduce the stitches to 6 before securing. I have never used circular needles. How do you join to the round. Here is an instructional video I found that I hope helps. Thanks a lot That’s a great help. Just a quick question, since I didn’t see it in the pattern – since a DK weight is required, is the pattern knit with two strands together? just wanted to make sure before I cast on – can’t wait to get this knit up! My measurements were based on single strand. hi just wanted to ask I’m knitting the preemie hat but on straight needles how do i follow the decrease pattern? plz can you explain? Do the decrease rows on knit rows and purl the alternate rows. First of all, I LOVE this pattern. What does DK stand for??? I have made 3 hats and counting. Best friends just had thier first baby and they LOVE hats. I also wanted to ask your permission to make these hats from your pattern and sell them to others, and I also want to make a bunch and donate them to the local hospitals. Just wanted to ask first, I seen others ask but I just didnt feel right doing so without asking first. DK stands for double knit. It’s a weight of yarn lighter than worsted but heavier than sport. You can sell them. I do appreciate you asking. Love this pattern. I am fairly new to knitting and just using small circular needles. As I try to knit the ribbed rows it seems like my work is getting very twisted, going back and forth between knit and purl. I have ripped it out 5 times now. Any suggestions?? Give me more details about how it is twisting and I will try to help. This is my second attempt at making the newborn hat. I dont understand what im doing wrong. Its too little. I just remembered i used size 7 needles. I guess i need to check my gauge. If its too small do i cast on for the preemie size or for the next size up? If you cast on for the preemie size before and it was too small, then cast on for the next size bigger. You dont repeat each decrease round five times, right? Its just the pattern in each decrease round you would repeat. For instance the round 9 you would repeat k2tog, ssk until done with that round and not repeat the whole round 5 times. Right. Repeat the pattern for that round. You have my permission. Thanks for asking. Happy knitting. Hi, I’m knitting (trying) a newborn hat and cast on for that size but the base looks HUGE! It doesn’t look like it will fit a baby. Does it magically shrink? I love making infinity scarves and rarely cast on more than 50 stitches for that and they go around adult shoulders. Am I missing something? Help! It should measure 12 inches. Your gauge may differ. Hi, I want to make a hat for a preemie. If I cast on 60, how do I then divide with multiples of 12 on each needle? If you are using 3 needles then 24/12/24. If on 4 needles then 24/12/12/12. If you are more comfortable having an even distribution, the multiples of 12 distribution is to accommodate the crown decreases, so you could start with 20/20/20 or 15/15/15/15 and just redistribute stitches before beginning the crown decreases. Thank you for your reply! What if I am using circular needles? Should I just go down to casting on 48 and distributing 24/24? I do the magic loop method with uneven distribution and it works fine, so I would think using two circulars would too. You could work with 30/30 until you got to the decreases and shift to 24/36. This is a great little hat! May I have permissions to use this pattern to make beanies to sell? Thanks so for sharing it here! Thanks for asking. You do have permission. Lovely, simple pattern. Thanks for sharing. I had a question about yarn weight. I’ve found baby weight is a #1 or a #2. I’m making this hat in newborn now with #3 weight (bernat softee baby),and its working great, but have found some great #1 weight (vertigo comfort baby)and would like to use it for another newborn size hat . Will it make a big diff in my final size? If so what adjustments will I need to make? Thanks in advance. I think knitting looks and feels best when the needle size recommended by the yarn is used. So I would recommend using the needle size recommended by the yarn. If you give me the gauge indicated on the yarn, I would be glad to give you the correct cast on to get the same newborn size hat. The gauge indicated is 7.5 sts = 1″. It recommends us size 3 needles. Cast on 96 stitches and use the size 3 needles and it should be perfect. Thank you so much for your quick response. You are so helpful to us new knitters. I think knitting usually looks and feels better when the recommended needle size is used. What gauge is given on the yarn? I can adjust the cast on for you. Thanks…I really appreciate the help. Guess what I’ll be doing tonight? Love the pattern. Lovely pattern, just wondered if you don’t find the rib very loose on 4mm? I usually do my ribbing on a needle one or two sizes smaller than the stocking stitch section. Some patterns do suggest smaller needles on the ribbing and some knitters prefer it. I’ve not had issues with it being loose (and don’t want ribbing too tight on a little one’s head) but that is just my personal preference and experience. It is fine to knit the ribbing on smaller needles. I notice a lot of people prefer to knit in the round on dpn. What’s the difference between dpn & two circular needles? Also I’ve been trying to use dpn’s and I get a gap at the end of each needle. What am I doing wrong? There is a big space vertically completely down. I don’t get any gaps with two circulars. Any thoughts or advice is greatly appreciated. If two circulars work for you, just stick with it. I personally don’t like working with dpns at all, and actually didn’t make a lot of hats until I discovered the magic loop method using one long circular. I think the secret to any circular method is to pull extra tight on stitches at the joins. Just stick with the two circulars. There is nothing better about dpns. How would I adapt this pattern for a gauge of 5 stitches to the inch on size 6 needles (to match a sweater) for a 3 month old. How many to cast on and how to adapt for decreases. I would like to cast on 78 stitches? Thanks. With a 5 stitch to inch gauge, 78 stitches would work out to be 15.6 inches. That would be on the large side for 3 months. You want to make the hat a little smaller than the baby’s head and it will stretch to fit. Thank you so much for sharing your patterns on here! I’ve just started the toddler’s hat which I’m planning to make two! One for each of our nieces for Christmas! I was wondering if you have a mitten pattern that I could use to match the hats? I would love to use the same wool I’m currently using. I’m using the double ended needles (I’m a fan of no seems!). A TIP for newer knitters: I really love the BAMBOO needles! I find them much easier to use (especially smaller sizes) than the plastic or metal ones (which can be quite slippery and frustrating if you are using double needles! I’m developing a top down, two at once mitten pattern, but don’t have it ready to publish yet. I found this basic mitten pattern for dpns. This pattern looks great! Thanks so much for sharing this! I will give it a shot and look forward to yours! Can I ask what method you used to get your stripes so neat? I have tried traveling jogless & picking up stitch below as I knit 2nd row. I’m not real happy with my results because I can see the switch in the back. Is there a way to create a smooth stripe that just looks like your knitting a solid color? No bumps or pulls or end of row showing? I love stripes but I’m so frustrated with this ugly flaw down back of my hat. Help! My sample was made with variegated yarn. I have the same issues with stripes and haven’t been satisfied with the methods I’ve tried. Maybe someone else will respond with a tried and true method. I realize that k2tog and ssk are both ways of decreasing. Is there any reason I couldn’t just k2tog twice instead? Doesn’t the ssk change the angle or direction of the decrease stitch? You can just decrease with k2tog instead of the ssk and the hat will be the same size and shape as one with the ssk. The difference is in the appearance of the stitches. With the k2tog/ssk combo for the decreases, from the crown there will be a spoke (some say star) pattern. It gives the appearance of two columns of stitches and stitches running under them from either side. So I made this pattern. Super easy but it really bunched up at the top with almost a star like look from the top. It wasn’t a smooth rounded top like I thought. Did I do something wrong or was it supposed to look like that? I used a circular up until the crown where I switched to DPN’s. Did you make one of the larger sizes? The smaller sizes should definitely have smooth rounded tops. I have gotten comments about the larger sizes being bunched. What some have done is after the rounds I have for the crown, they add another round of knit and then a round of k2tog before finishing. Nope it was the 6 month size. I am going to try it again and see what happens. If I cast on 88 what would my decrease be? I want to make this hat with worsted weight for a 5 year old. Can you advise me on needle size (7?) & do I follow toddler size hat for # of stitches? What needle size does your yarn recommend? And with that needle size what is the gauge? The hat should be an inch or two smaller in circumference than the 5 yo’s head, so if you knew what size it needs to be, I could give you an exact cast on. Hi there! I just knit the toddler hat and it is huge! Way too big for even my husband. I checked my gauge and it’s correct, I can’t figure out what I did wrong! Help! I went back and recalculated my circumferences and agree that what I had labeled a toddler size with the 108 cast on is much larger than a toddler size. I am so sorry for that. I have changed all that sizing in the pattern now. A cast on of 108 with a gauge of 22 stitches per 4 inches would produce a 19.5″ hat. This would be a teen or small adult size. On a very small circular, they can be knitted up to the point of the crown reductions on one circular needle. I use a long circular with the magic loop method at that point. You can also use two circular needles to achieve the same effect as double pointed needles. There are both pictorial and video tutorials for both methods. Cast on 60 and it will make a 14 inch circumference hat that will stretch an inch or two. I am relatively new to knitting & crochet, having been knitting for about 2 years, and starting simply patterns for about 4 months (crocheting only for a month so far). I agree that you would use the same k2, p2 pattern for both sides of flat knitting for the rib. You can use two K2tog instead of the SSK, just as you say, it would have a different look. Thank you so much Mama! I am having a browse through your other patterns, as my good friend & her husband are expecting their first little girl in March 2014 – so I have plenty of time to knit & crochet! Thank you again! I assume that is 11 stitches per 4 inches with a bulky. Cast on 48. I only have a size 8 circular needle for this basic baby hat. How many stitches should I cast on for a newborn? If you are using DK yarn, cast on 60. This isn’t mine, but looks like a great basic baby hat in crochet. Bonjour, If I cast on 72 what would my decrease be? I read all the previous answers and can’t really figure it out… My first hat! Just follow the crown directions as written, repeating it around each round. You will repeat it 6 times across the round. Would mind giving the number count after each decrease row for each size? I love the ease of this pattern and would appreciate it greatly. That’s a great idea. I added those to the pattern. I just finished this hat for a toddler size- and it WAY to big- I used the magic loop method and it’s about double the size- I’m not sure if I did something wrong? I’m sorry about that. Not everyone knits to the same gauge. On your finished hat you can measure 4 inches across and see how many stitches you have per 4 inches. I used a gauge of 22 stitches which is typical for a DK weight yarn on size 6 needles. I was just wondering if you had any suggestions for using 4ply instead of 8ply. I was hoping to make this hat to match the cardigans I am making for my son and niece and have been using 4ply on those and should have enough leftover for this project, too. For them to coordinate best, I’d recommend using the same size needles you used for the cardigans. Let me know what size hats you want to make and your gauge and I’ll convert the pattern for you. I would like to make this with size 5 needles for a newborn. What would you recommend I cast on? If you are using DK yarn, there won’t be a big different in one size of needles. You should be fine following the pattern as written. I’m new at knitting, and your patterns are beautiful. So looking forward to making several of the patterns. Your lay out of your site is so inviting. Just LOVE it. I’m using this pattern but just am a little confused about how to divide the 84 sts in multiples of 12 on dpns. Could you please be more specific about how many to put on each needle to make the pattern work? Sorry for such a stupid question, but thanks in advance for any replies. If you are dividing between 3 needles, put 24 stitches on two of the needles and 36 on the other. If you are dividing between 4 needles, put 24 stitches on three of the needles and 12 on the other. Thank you for replying and being so prompt! Hey Mama! I wanted to ask your thoughts on making a matching hat for a cardigan I just wrapped up. The yarn is Cascade 220 Sport, and the gauge lists at 22-24 st./4″ on size 5 or 6 needles. I clocked in at 24 st/4″ (6st/in) on size 4 needles. I want to do the newborn size for the hat…. suggestions for a cast on with the size 4s? Thanks in advance! I will give you measurements/cast on amounts and you can decide which will work best based on how stretchy the knit is and how much room to grow you want to allow. Average newborn head circumference is 14″, so beanie that fits without being saggy is usually 13″. With the repeat of this pattern, for your gauge, if you cast on 72, you will get a circumference of 12″. If you cast on 84, you will get a circumference of 14″. Thank you for this pattern. It was just what I was looking for! Your instructions are great and I found it was nice and easy. This was also my first opportunity to try magic loop and I found that I really enjoyed the technique. The only thing is that at a few points in the ribbing the stitches are stretched out. It basically looks like that column of ribbing has lost it’s elasticity (I hope that makes sense). Any advice on how to prevent that? Could it have been the cable I used? The cable can contribute to that if it is stiff. I use Addi and Harmony circular needles which have very supple cables. It also just takes some practice getting the tension right (a little tighter) on the stitches right before and after the loops. Hello thank you for your pattern! I am making a lovely hat but as I am doing the decreasing and it is getting smaller, it is getting so tightly stretched on my circular needles it is really hard to knit!! Am I doing something wrong? When you get to the crown where the decreases are made, you will need to shift to double pointed needles or some other method of knitting small circumferences in-the-round. Alternatively, you can start knitting back and forth and make a small seam in the crown. Hi there! I LOVE this baby hat. I just made it for my son that will be born in a few weeks. Thank you for posting the pattern. I’d like to make one for my husband as well. How many should I cast on with? How many rows should I knit the ribbing for and how high should I knit the hat? Is there anything else I should know that would be different when making this pattern for an adult? If you know what yarn you’d like to use for your husband’s hat, give me the recommended needle size and gauge and I’ll work it all out for you. also what size needles would you recommend? HI! I left a message for you but it seems to have disappeared. I’d like to make this beautiful hat for an adult. Would you please tell me how many to cast on and what size needles I should use? I made the infant hat and it is so cute! Thank you for the pattern. If you know what yarn you’d like to use for the adult hat, give me the recommended needle size and gauge and I’ll work it all out for you. Knitted this hat in a Canadian style. It came out veery cute! I have posted pictures in Ravelry. This is my first magic loop hat. I noticed in the ribbing that on either side where the loop is on one side is two knit rows side by side and on the other loop side is two purl rows side by side how did that happen and how do I fix that? Thanks! I don’t know how many stitches you started with, but my guess is, one of the odd multiples of 12, such as 60. Then it sounds like you divided evenly between the two parts of the magic loop (30/30), rather than in multiples of 12 (24/36). I generally advise to divide in multiples of 12 to make the crown reductions simpler, but dividing evenly for the ribbing and body is fine IF you then mark the first stitch of the round. At the loop that is not the first stitch of the round, continue the pattern from before the loop. It sounds like at the non-beginning loop, you began the pattern from the beginning of the row again. I just finished this hat, it came out well. It is a little big, and I cast on 72 stitches, I did however use two needles instead of the dpn or circular needles so I’m wondering if that’s what did it? This hat came out a tad too big and fits my head and would be too large for any average baby. These were amazing instructions by the way! I’d never made a hat before and other than the size and a few bumps along the way it turned out great! Sometimes your tension from method to method can differ and can make a difference in your gauge. I’m sorry it came out so large. Hi, Just wanted to check if I will get the same pattern shown in the pic after the rib stitch if I just do knit. Or should I do purl to get that pattern? The pattern is written to be made in-the-round, so it is not turned after each row. When doing in-the-round, stockinette is made by knitting every round. This is probably a stupid question but I am a new knitter so please forgive me! I tried knitting this for a newborn and followed the pattern to the letter but when i finished the crown was tiny! was i supposed to repeat the rounds a few times to make it bigger? how do i know how many times to repeat each round? Thanks in advance for any help! Just realised my own stupidity.. didn’t read the pattern properly, i have figured it all out now Thanks!! This pattern is awesome by the way!!!!! I stupidly began knitting this pattern on circular needles with a cable just long enough for the main part of the hat, but I realize now that will cause problems when starting the crown. Should I somehow switch over to double pointed needles for the crown? You will need to switch to dpns or to a longer needle or needles for another method of knitting a small circular piece, such as the magic loop. Alternatively you can split at this point (purling the back rows) and have a seam just in the crown. Thank you for the pattern! I’m a newborn photographer and fairly new knitter. I started making the newborn size and saw immediately that it was way too big so I started over and made the preemie size. It was also huge. My finished hat (outside dimensions) was 14″ circumference and 6″ tall. I am going to attempt to make another by starting with 48 cast on and knitting until 3.75″ high before beginning my decreases and see it that works. It just stinks because I’m no a fast knitter yet and it took me several hours to make this (and it won’t work). I think the hat I have right now would probably be like a 3 month-old size. Gauge is really important. The cast on amounts and dimensions I give are for a gauge of 22 stitches per 4 inches. With that gauge, a cast on of 72 will give a circumference of 13″, which is a good size for a 14″ newborn head. Hello, I was wondering if this pattern is stretchy. My toddlers head circumference is 18 in. and I am hoping that this hat will last throughout the fall and the beginning of winter. It is as long as your yarn has some give. It should have room for growth. Thank you for sharing your patterns. 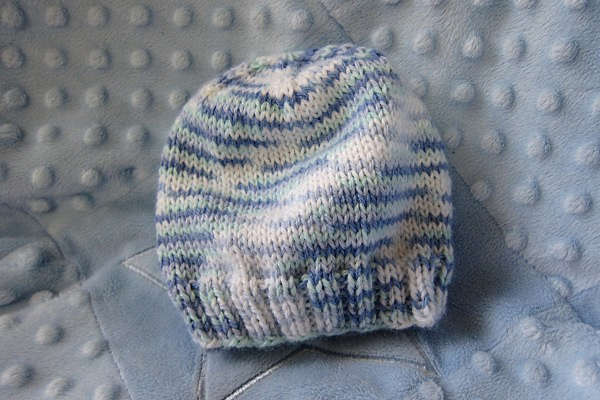 Can the baby caps be knitted with worsted weight yarn? How many stitches do I need to cast on? Cast on for a size smaller than you want. Hello Mama. Thank you for such a Helping Pattern. I am a beginner. Please help me regarding using 2 needles. If we are making a cap for new born with 72 cast on sts.,using 2 needles , then what is meant by dividing Sts with multiples of 12 ? 12×6=72 …. does it mean i need to make 6 rows , 6 rounds or ( does dividing means i need to cast on sts on both needles). Are you knitting flat with two needles? Dividing the stitches in multiples of 12 is for knitting in-the-round. If you are knitting flat, then you will need to purl the back rows. Just knitted a newborn size in about 2 1/2 hours. Great easy pattern. I was just looking for dimensions and how many stitches to cast on and this worked out well. I used a slightly bulkier yarn so I actually cast on for the preemie size. It is a good match for the newborn size. I’ll be making these for friends with kids! Knitwise means the way you insert the needle in a stitch to knit it. Purlwise is the way you would insert the needle in a stitch to purl it. I am making hats and scarves for all 5 of my grandsons,and hoping to get them done before the snow falls! I have one question,I want to make all their hats the same but the little guy needs some ear flaps. Is it possible to add ear flaps to a pattern that does not call for them? Most any hat that has a straight (not rippled) edge could take flaps. You could just use that portion of another pattern to add it. How do I knit a button for the top of the baby hat I just made. Do you want to cover a button form? Can I do this on 32″ circulars? Or is 40″ absolutely necessary for the magic loop method on baby hats? You might give it a try. If the connecting cord between the needles is soft enough, it could work. The longer cord makes it less likely to lose the loop that is kept pulled out. I have made your hat before and love it. Now my darling grand is older and I would like to make the toddler size in a worsted weight yarn. The yarn calls for size 8 needles…will it work? Thanks for your response – seems to have turned frigidly cold over night. Yes, but you only need to cast on 72 stitches. Thanks! I love the decreases – such a cute top. I’ll have to throw on a little pom-pom maybe. I used 4mm but with worsted, so I did a 12 month size to fit my toddler grand. Thanks again – very generous. I started this hat and when I was finished with the ribbing I realized it was all twisted. So I undid it and started again, this time making sure all of my stitches were straight and lined up before I joined them. And it happened again! Does anyone know what I did wrong?? Help because I am extremely frusterated and confused. Thank you so much that helped a lot! I finished my hat and can’t wait to give it as a Christmas gift! Already on my second one!!! This is my second ever knitting project, first ever knitting in the round and using dpns. It was easy to follow and turned out great! I only had size 8 needles so I used the 12 month sizing for my 2yr old and it turned out perfect. I also added a couple color stripes. I’m so happy with it! could you please give me the pattern for six months? not in there? That size will be a little trickier, but I will describe how to do it. Cast on 78. Instead of being divided on the needles in multiples of 12, the needles should just have complete sets, where the sets are 14/12/14/12/14/12. Continue with the pattern until the hat measures 5″ from the cast on edge. Before starting the crown, there are 78 stitches. You will have a special set of rounds before beginning the regular crown rounds. Then begin with round 1 of the crown. i now have an IPad and am wondering how to save this pattern to it. I do not use Facebook. If you have a PDF reader, there is a button at the top of each pattern that will create a pdf of the pattern. My first hat and first time using the Magic Loop technique. So easy. Thank you for the pattern! This was my first project knitting in the round – thank you for the perfect project to learn on! It came out beautifully; I can’t wait for my little one to wear it come spring. Thanks! I messed up the first round of decreases because I forgot to add the extra k4. what can I do to get it back on track (I’m doing the toddler size and after the first round I have 72 instead of 80), I really don’t want to start over!!! Continue to ignore the extra knits (k3, k2, k1) but knit an extra round between the decrease rows (make the decreases every third row instead of every other row). That will work out very similarly. Thank you for the lovely pattern! This was my sons favorite hat. The toddlersize is now too small for him, but the following size will be too big. Is there an “inbetween” size? That size will be a little trickier, but I will describe how to do it. Cast on 102. Instead of being divided on the needles in multiples of 12, the needles should just have complete sets, where the sets are 14/12/12/14/12/12/14/12. Continue with the pattern until the hat measures 6.25″ from the cast on edge. Before starting the crown, there are 102 stitches. Hi. Thanks for the pattern. It seems that when I knit the rib, it’s very loose. I am using size 2 circulars, as the yarn is very fine. I really don’t want to rip this out and start again. Any advice? As long as the ribbing is a little tighter than the stockinette portion it should be fine. Just finished the hat using Bernat Baby Jacquard…absolutely darling! I added an I-Cord, but would really appreciate your expertise on how to end with a 3 strand I-Cord, about 3 1/2″ long…long enough to knot. Thank you! Hi, I’ve made several of these and love them and the pattern. I have some sport weight yarn I’d like to use to make a few. Newborn. The gauge is 6.25 on size 3 needles. How many stitches should I cast on? I was just going through some hat patterns, when I came across your blog. First of all, thank you for the effort of putting these patterns and also keeping up with the replies to everyone’s questions. It’s a wonderful hat pattern. I have a question. If I use the same pattern for a newborn ribbed hat, will it fit. Or do I have to cast on a different number of stitches? Also, do you mind if I sell the stuff I make with this pattern? I know many have asked before, but doesn’t feel right without asking you personally. Thank you again for this wonderful pattern. You can use the same cast on for a ribbed version. The finished hat will measure smaller but will be much stretchier so will still stretch to the same size as the stockinette version. You can sell items you make with my patterns. At the bottom of the patterns is a link to my permissions document so that you can be assured that is my usual policy. HI, I am using a number 3 light yarn, how many stitches would I cast on for a 4 month old baby? I know you called for a DK weight. DK falls into the 3 light category so should be true to my measurements. The newborn size has growth room so should work for 4 months. Now we are not quite done. This pattern has cast ons that are a multiples of 12, so find the multiple of 12 closest to what you calculated, which in this case would be 84. The pattern is correct as it appears. I am knitting your pattern on straight needles and got to the crown section, and was unclear about the decreases. Are you stating k4, k2tog, ssk K4 to mean you only knit 4 at the start of the row and knit 4 at the end of the row, with K2tog and ssk from end to end, or do you mean K4, k2tog, ssk knit four through out the entire row. Dear Mama, You are so patient to answer so many questions! Thank you. Hopefully, I won’t have any. This is my first time knitting with round needles, and I’ve gotten my ribbing done. What does the ssk look like? Is there a video to which you can point me? I understand the slipping the stitches, but it’s the knitting afterwards I’d like to see. Thanks! Thank you !!!!! Have been racking my pea brain for a charitable use for my #3 weight yarns & dk yarns. Now I can go to town on using up my yarn shop quantity of the stuff. Keep up the good work!!! I am knitting the newborn size with 72 stitches. I just started the first decrease row and I wound up with 54 stitches. I knitted 4 – knitted 2 together – slipped 2 and knitted together. What am I doing wrong? Your pattern is such a nice simple pattern with a wonderful look. I want to finish it to send to my new granddaughter in Colorado. Thank you. I’m so sorry it has taken me so long to reply. There are 4 knits before and after the reductions on each repeat, so you will actually have 8 knits between them. So, k4, k2tog, ssk, k8, k2tog, ssk, k8… … k2tog, ssk, k4. Just completed this on DPN and I loved the pattern. This was the first time I did a complete project on DPN; I’ve transferred other projects from circulars to DPN to finish off decreases, etc, and they’ve turned out great. Here’s my question: I can see the spaces on the finished hat where the stitches were divided on the three needles. I thought I was pulling tight on my stitches between the needles, but maybe not enough. Are there any other tricks to keep these seams from appearing? Thanks! It really just takes some experimentation and practice. It does take pulling those end stitches a little tighter and after seeing the results a few times, you will get the sense of how much tighter they need to be. This pattern is great! I’ve never used dpns before, but I’m trying them for this and it’s going wonderfully. I have a question…when doing the actual body of the hat, before getting to the crown, it says for the newborn size to knit until it is 4.75″ tall. Is that including the ribbing, or is that just the knitted body section? That includes the ribbing. So measurement from edge. Hey Mama! I’ve knitted one of these beanies before for a 12 month old and it turned out perfectly! However, I won’t be able to have a hold of my circular needles for a while so I was wondering how many stitches to cast on US size 3 (3.25mm) straight needles for a 6 month old? The yarn is 8 ply and the gauge tension is 22sts by 30 rows for 10x10cm. Also what should be changed throughout the pattern as well as the recommended length of the hat before the crown process? That size will be a little trickier, but I will describe how to do it. Cast on 78. For straight needles, you will knit the body in stockinette. Continue with the pattern until the hat measures 5″ from the cast on edge. Then begin with round 1 of the crown. For straight needles, purl the even rounds. How many stitches should I cast on for a 6 month old? And how long should it be before the decrease? I love your little hat but I don’t like circular needles. I casted on 84 stitches on straight needles and not sure how I should start my decreases. I’m confused with the purl side and the counting. Doesn’t the purl row add extra size to the crown. I know I only decrease on the knit size but should I add extra decreases since I’m actually doing a purl row? Thanks. No, just purl the back. You are just replacing the knit only rows of the crown with purl instead of knit. i felt like this pattern doesn’t have enough information and detail to follow it found it very hard my hat looks crap and i find i different pattern this pattern didn’t work i would put more information on your patter clearly it’s a garter stitch knit and purl but doesn’t say that so i start following the other instruction yeah should really put that in their so it’s not so confusing more information please! I’m sorry it was confusing. It is made in the round so by knitting every round it makes the hat stockinette rather than garter. i’m going to retired it i didn’t know you used double pointed needles lol when i try the pattern i use circular so i’m giving it another shot i just recently learn how to knit mittens with dp needles so knowing what i know now it will come out better. i think now after knitting a mitten that your pattern might make more sense now at first I used circular needles which probably wasn’t a good choice so I’m going to retried this pattern knitting on double pointed needles I think it will make more sense now i don’t think i saw it was double pointed needles you use at first. Can this baby hat be knitted with circular needles all the way through? I am wondering if it will be ok to do so. The body of it can be worked on a small circular needle, but the crown will get too small for it. The crown will either need to be made on double pointed needles, made using some other small circumference in-the-round method, or will have to be completed flat instead of in-the-round and seamed. For my big 10 month old, do you think I should be doing the 12 month or the toddler sizing? The 12 month size should be good. It’s stretchy and will have some give for some growth. If I am using a size 7 circular needle, how many stitches should I cast on for a 12 month hat and does that alter the pattern in other ways? Thx! It may not make a material difference. It really just depends on your tension. If you make a quick gauge swatch and you are close to the gauge of the pattern, you wouldn’t need to make any changes. If you have a loose enough tension that your guage is less then you could cast on for the next smaller size, but use the measurements for the 12-month. for regular wrosted yarn( red heart) how many stich should I pick up? Use size 8 (5mm) needles and cast on 72. Knit 5.75″ before beginning the crown section. I assume by main page you are referring to Ravelry. I’m sorry it didn’t match the pattern. I have now changed the Ravelry page. I’m a beginner and I had a couple of questions for this project. I was wondering about the sizing of the hat “Newborn – Cast on 72.” Wouldn’t this be too large for a newborn? I just finished my first knitting project ever which was a baby hat. In those directions, it says for newborns, to Cast On 56 stitches. By the time I was done, it seems like the perfect size for a newborn that will be welcomed into the family in a month. Since 56 stitches seems like a good amount to Cast On for a newborn hat, would this change how I would knit the crown? Or should I start over and use the “Preemie” size from above? I want to make sure this second project that i have ever done will turn out perfectly! Sizing depends on the weight of the yarn and the size of the needles used. If the pattern you refer to used heavier yarn and larger needles, then 56 stitches would be a newborn size. A newborn head is usually about 14″ in circumference. Knitted beanies of smaller sizes should be about an inch less than the circumference of the head since it will stretch to fit and stay on but not be too tight. With DK weight (Light-#3) yarn and size 8 (4mm) needles, the 72 stitch cast on works out to be 13″. Hi. I’ve made two of your hats before and pattern was perfect and beautiful on my baby, thank you! However, being so tired (10 months of very poor sleep) I have made a mistake. I’m making the 84 stitch size hat and have made a mistake in the first three decreasing row stitches, by doing, *knit 4, k2tog, ssk*, knit*, *knit 3, k2tog, ssk* rather than *knit 4, k2tog, ssk, knit 4* etc. Please help…..can I salvage the hat? I get little time to knit now so will be gutted to have completely ruined it. The “spokes” as you would see them from the top would not be visible with the way the decreases will have shifted around on the round. If you’d rather proceed without that look than to rip back, then just continue as you’ve been going so that the decreases will at least be consistent. I have knit this hat several times for different babies in the family and now have need of it again. I read through the comments this time (and learned quite a bit in the process), but I just wanted to let you know that this is a fantastic pattern and you are incredibly gracious and generous with your time, knowledge, and patience. Thank you for such a wonderful pattern! I was looking for a pattern to fit a very old doll. I picked it up the other day. Your knitted hat will work out great. I know I could never have tryed to create a pattern! That’s because I have in the past. To say the very least, thank you for understanding the how’s on pattern making. I need to make this hat for a baby that is now 3 months old. Can you tell me how many stitches would be good to cast on. I have one ball of Bernat Softee Baby multi color which is 330 yards. I would like to make the basic simple hat like the newborn one in knitting. many thanks in advance. Cast on 78. Follow directions until you have 6.25″ from the beginning edge. Make these two rounds before beginning the crown rounds in the instructions. Can you please tell me, what it that means ssk,? ssk produces a decrease with a left slant. It can be done other ways. Here is a link to an explanation of all the ways it can be done. Hello, I was wondering if it would make a huge difference having 5 mm double point needles instead of 4 mm? It could actually make a pretty big difference unless you are a really tight knitter. You might need to make a size smaller than what you are wanting to make. same hat, blue/cream stripe? Hi! Love this pattern. I think I’d seen it a couple of weeks ago where you also showed a photo of same hat, but in a cream and light blue heather stripe. Now I cannot find that anywhere, but am wondering how wide to make my stripes! Thanks! I haven’t made it in stripes myself but lots of other people have made it in stripes, so it may be a picture you saw somewhere else but using my pattern. worsted weight yarn and bulky weight yarn. stitches over 4″ using circular and dpns. For worsted: Cast on 60. Begin crown when the body measures 4.5″. For bulky: Cast on 48. Begin crown when the body measures 4″. Love this pattern. Thank you. I would love to make the baby hat in a 0-3 month size. End a tad shorter because you will be making two extra rows for the crown and also have taller rows with the bigger gauge for the crown (therefore the crown will be a little taller). so if I use size 5 needles for infant how many sts do I put on? Depending on your gauge it may be the same. Check your gauge and if it looks like you are going to get more stitches then you would need to cast on for size smaller. Sometimes one needle size doesn’t make a significant difference. I have never knitted in the round before but decided to try this little hat. It is easy to do and very effective, was my daughters favourite hat for her baby. I used random wool like the pattern but in Autumn colours. It got lots of comments. I am now knitting my 4th one! How can I make this bigger for an adult hat, male. Father and son hats. The easiest way is to use heavier yarn and bigger needles. Size 8 needles with worsted or aran yarn will give an small adult size with 84 cast on, medium adult size with 96 cast on and large adult size with 108 cast on. Make the body of the hat up to 1.75 inches shy of how tall you want the hat before starting the crown. I am knitting the newborn size and casted on 72 stitches. For the Crown, Rnd 1 says I should have 70 stitches after completing Rnd 1. I will only have 70 stitches if I K4, K2tog, ssk, k4 once and continue to knit and do not repeat. Is 70 stitches correct after completing Rnd 1 of the Crown or should it read 56 stitches after Rnd 1? Newborn in the second size so is actually saying 60 stitches after the first round of the crown. Round one is repeated 6 times around the hat for a reduction of 12 stitches. Worsted weight would actually make it bigger. Also the gauge in the pattern is for 4mm needles so 5mm needles would make it bigger. I have never knitted before and am trying to make a premie hat. How long should the circular needles be? I bought US 10 that are 29″ long, thinking that was plenty long, but now I am not sure. 29″ probably isn’t long enough for a the “magic loop” method. US 10 are for bulky yarn. To get the right gauge with my bulky yarn I ended up with 56 stitches for the teenage size, what would my decrease for the crown be? …do I just start the decrease from row 3? K3,2tog,ssk,k3 would be 8..8×7 =56. Can you tell me what cast on method you use & does it make difference -I normally use the thumb method (long tail -I think), but thinking of using the cable method, thanks. I use the long tail method. Any method that is stretchy should work. Hello – you show a picture of a blue and white striped beanie which is just what I was looking for as I have pink and cream wool, but I can’t the pattern anywhere, only this one for the self patterned yarn. Can you help? Many thanks. That picture is of the beanie made with the self patterned yarn. It just looks like stripes. Could you also direct me to where I can find help learning how to knit with two circular needles. Just Google ? I have only ever knitted with dpns and am not feeling too confident about the magic loop. This article has that method as well as the others. When I do the crown I don’t end up with the amount of stitches that the pattern says I should have. I’ve tried over and over to get the amount that I should get. How many stitches do you have before starting the decrease and how many do you have after? Can this pattern be made on two needles. I do not know how to use ddn. You can make it with a seam. Just purl the back rows of the body of the hat and crown. I’m making the Basic Baby Hat and am ready to start the first decreasing round. I would like to confirm before I begin. The instructions indicate k4, k2tog, ssk, k4 so in that pattern of stitches, I do both the k2tog and the ssk, so reducing 4 stitches to 2 between the two k4 sections. Correct. So for each repeat around the round you are reducing by two stitches. Absolutely. The pattern is a repeat of 12 stitches. I would add a stitch in the round before starting the cables for ever cable you add since cables tend to pull in. So considering that just add cables in a repeat keeping with however many resulting stitches you have in your repeat. So if you added one cable in the center of each repeat, add a stitch in the middle of each repeat in the round before adding the cables. So then your repeat would be 13, so have a pattern that repeats every 13 stitches. I really enjoyed knitting this hat in the newborn size. It was my third attempt to find a pattern that would be large enough for a newborn. The others turned out doll sized. I only had one question…Why on the crown did you give the instruction to knit after each decrease row? I did a purl row and it kept the stocking knit pattern all the way to the top. If knitting this row it would have created a ridge and your example does not show a ridge. It sounds like you knitted this flat with a seam, which is perfectly fine. The pattern is written for in-the-round knitting, so every row is knitted to keep the stockinette pattern. I just made a beautiful baby cap for a friend’s newborn baby, and I want to thank you for such a nice pattern. I don’t knit a lot. Recently I made an adult cap just making up the pattern (my first knitted cap ever), but this baby cap (the 2nd knit cap I’ve made) has a much nicer finish on the top. Thanks so much for sharing your patterns and tips! Lovely hat! Two questions: The baby is 6 months old and her head is 16″ around. I am using yarn with a gauge that’s 4.25 sts/inch, so should I cast on 72? 72 is the closest multiple of 12 to the 68 sts actually needed for the CO. (16 X 4.25 = 68) But 72 is going to make it nearly an inch wider. If that’s still the best solution, how high do you recommend I go until starting the crown? At 6 months her head is probably higher than the 72 st CO size. Thank you in advance for your advice. Beanie style caps need to be a little smaller than the head size or they will be too loose. Knit is very stretchy, so it won’t be too tight to make it an inch smaller than the head size. A cast on of 64 will make a 15 inch circumference hat. That size will be a little trickier, but I will describe how to do it. Instead of being divided on the needles in multiples of 12, the needles should just have complete sets, where the sets are 14/12/14/12/12. Continue with the pattern until the hat measures 4″ from the cast on edge. Before starting the crown, there are 64 stitches. I have lots of Caron Simply Soft Medium 4 weight yarn and would like to knit this hat for my 3 month old grand daughter. How would I adjust this pattern? Use size 8 (5mm) needles and cast on 60 stitches. Use the newborn height for the height of the body before starting the crown. How many stitches will be on each needle for a premmie baby hat on the double points? If you are using 3 needles it would be 24/24/12. If you are using 4 needles it would be 12/12/24/12. There is a print button at the top that will create a clean copy to print or a pdf to download. I am a fairly new knitter and made this hat for my toddler. It was the first hat that I’ve made and it looks great. Thank you so much for your patter and all of the comments. They really helped. I am a true beginner, but have recently done an adult hat on round cabled needles. How can i convert this pattern to cabled needles and what size would I need? It would have to be a very small set. They have sets for socks. You will still run into problems on a circular when you get to the crown reductions. There are methods out there of using two circular needles to work small circumferences in-the-round. Help! I cast on 72 stitches and started the first decrease per instructed: K4, k2tog, ssk,k4, etc. and supposedly you end up with 60 stitches remaining. Is this an error? What am I doing wrong? It doesn’t work out mathematically. I just found this pattern and I love how the different sizes are included and I plan on using this pattern for future baby hats. This hat is so cute! But you got a question from India who asked how many stitches to cast on for a toddler and you replied 108 stitches. That comment was from 2012. On 11/3/2013 I made adjustments to sizing, so what is stated in the pattern now is the most accurate. What is meant by ssk? Thanks! New knitter. Have coasted on stitches. Now I am trying (4th attempt) to knit in a circle. Can’t figure out how to do that. Any help would be appreciated. Trying to make a preemie cap/hat. Search on YouTube for knitting in-the-round tutorials. There are lots and lots of videos that can give you great basics and tips. Hi Mama, I have a comment and that is you are amazing to be answering question for so many years and helping out so many knitters!! I was just looking on Ravelry for another pattern for premie hats. Thanks. Thank you so much for this lovely pattern with the nice crown – exactly what I was looking for! How many double pointed needles do u use. Three or four, whatever you are accustomed to. Just put the stitches in sets of 12 on the needles even if that means there are different numbers of stitches on each needle. Sorry about your experience. There is a printer icon at the top that will make a clean, comment-free version to print or create a PDF. We are working on updating the site to make printing even easier and user friendly. What is the magic loop? I was making the 12month hat 84 stitches. When decreasing, the pattern says knit 4 knit 2tog ssk knit 4. This doesn’t work. After the first round you are left with 64 stitches. The whole thing is thrown off. Had to look up another way to decrease this pattern. Please fix. It really does work. For the 12 month size the directions will be repeated 6 times around the round. k4, k2tog, ssk, k4 uses 12 stitches but results in 10 stitches. So you will begin with the 84 stitches but result in 60 stitches. Thank you for such a wonderful and versatile pattern. I found that using Paton’s Canadiana and 4.00 needles, I got the right gauge. I did a sample newborn using flat needles but not keen on back seam so will now switch to dpn. I loved the colours of a work sock (think sock monkey) and want to make several in all sizes for my grandchildren. Some will have red pompoms. The ribbing is ecru with 2 rows red and the body, light grey. Your pattern is easy to read. Happy New Year! I would really like to make this for a baby that will be 6mos. when winter begins. And about a year when it gets warm. Normally I would follow a 6-9 mo. Size. Is there any way to alter these instructions for those sizes? I’m a beginner and this is the first time I knit with dpns. I’m knitting the 12 months old size. How can I divide my stitches in multiples of 12 if the stitches are 84? Shall I put 24 on three needles and 12 on the 4th? Thanks! Yes. There do not have to be equal numbers of stitches on each needle. What is the Magic Loop method? The Magic Loop is one of the methods that can be used to knit in-the-round for circumferences smaller than a circular needle. I would like to use this pattern to make a hat for my adult daughter. Her head circumference is 23 inches. The yarn I want to use is acrylic (Premier Sweet Roll). 17 stitches = 4 inches. My needles are a size 8. She currently has a hat that when it is not stretched measures 20 inches around. Would you be able to tell me how to adjust the pattern so it would fit my daughter? I’m new to making hats and I’m confused on the rounds. I finished the first round. Do I then repeat that set of instructions for 70 stitches for a newborn size? Please help! For these hats the first 8 rounds are ribbing, so will be k2, p2 over and over for 8 rounds. Then you will just knit continuously until the hat is tall enough to begin the crown. When you begin the crown rounds, you will repeat the crown instructions 6 times around for each round. Could you tell me the amount of yarn needed for the different size hats? I am assuming the one stated is for the premie or newborn?